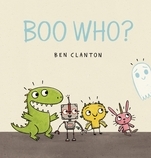 Ben Clanton is the creator of many books for young readers, including Rex Wrecks It!, It Came in the Mail, and the Narwhal and Jelly books. He is not a ghost, but he is somewhat shy. Ben Clanton lives in the Pacific Northwest.